Maps of the water content in the atmosphere of Mars suggest the Red Planet once had an ocean that covered 20 percent of its surface, a fifth of the planet. Most of that water was lost to space. New maps of water in the atmosphere of Mars reveal that the Red Planet might once have had enough to cover up to a fifth of the planet, researchers say. Further research to refine these maps could help guide the quest to identify underground reservoirs on Mars, the scientists added. A new NASA video describes the ancient ocean on Mars. Much remains unknown about how Mars lost its water and how much liquid water might remain in underground reservoirs. One way to solve these mysteries is to analyze the kinds of water molecules in the Martian atmosphere. Deuterated water is heavier than normal water, so it behaves differently. For example, it can be easier for normal water to escape Mars, since it can vaporize more easily in the Martian atmosphere. Solar radiation can break this water up into hydrogen and oxygen, and the hydrogen can then escape into space. 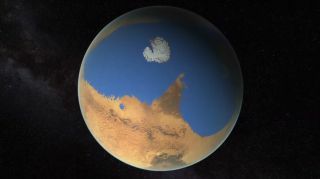 This still from a NASA video offers a glimpse of what ancient Mars may have looked like from space when a substantial ocean of water covered a fifth of the planet. By studying the current ratio of deuterium to hydrogen in Martian water, researchers suggested they could estimate how much total water the Red Planet used to have. They constructed new maps of the ratio between hydrogen and deuterium in the water in the Martian atmosphere using data gathered from 2008 to 2014 by the Very Large Telescope in Chile, and the Keck Observatory and NASA's InfraRed Telescope Facility in Hawaii. They found the ratio between deuterated water and normal water in some regions of Mars was higher than thought, typically seven times higher than in Earth's oceans. This high ratio suggests that Mars has lost a great deal of water over time. "We can now get a pretty strong estimate of how much water was lost on the planet," lead study author Geronimo Villanueva, a planetary scientist at NASA Goddard Space Flight Center in Greenbelt, Maryland,told Space.com. This NASA artist's illustration shows a view of how Mars looks today (left) and how the same region may have looked in ancient times, when an ocean covered 20 percent of the Martian surface. Based on their findings, the scientists estimate that Mars might have had enough water to cover up to 20 percent of the planet about 4.5 billion years ago. They suggest the Red Planet could still possess substantial underground reservoirs of water. Further refining maps of atmospheric water on Mars could help guide the search for these deep aquifers, Villanueva said. One would essentially look at such maps to see how much known sources of water such as Martian ice caps could account for this atmospheric water, "and any abnormalities might be released from hidden reservoirs," he said. The scientists detailed their findings online today (March 5) in the journal Science.